Only two years after the introduction of the Harley-Davidson K, lackluster sales forced Harley to upgrade the engine. Still choosing not to launch their OHV motor, engineers bumped the size of the K’s motor to 54 cubic inches, and the KH was born. That displacement, equal to 883cc, would become legendary for Harley. Harley also introduced an even more performance oriented version of the KH as the KHK. 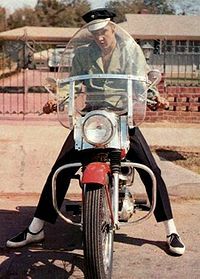 After upgrading from his ST165, Elvis Presley owned a Harley-Davidson KH. This Harley of Elvis's is the motorcycle widely rumored to have sold for millions after an unknowning owner discovered it belonged to elvis. Snopes.com has debunked this rumor as False.